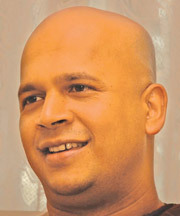 As his debut movie makes waves in the cinema industry Udara Ratnayake has his feet firmly rooted to the ground. For Udara, a Ratnayake family scion, acting has always been a passion. Growing up in an artistic family and watching his father, Bennett Ratnayake filming award winning creations like Aswesuma and Sulanga, the buzz around movie making is not alien to Udara. The excitement and charm in the industry had a zealous effect on him and motivated him to put his best foot forward into making good productions to enrich the field. He got his breakthrough in Ira Handa Yata, playing Rakitha, a soldier who tires to save his injured superior officer from the clutches of death. The role was demanding as Rakitha had to engage in a number of battle scenes, carry his injured counterpart, trek through the wilderness and battle with nature not only to survive but to fulfill his friend’s last request. His efforts bore fruit since the movie won several international accolades. With his debut effort making headlines Udara says that he could not have asked for more. He maintains, “I was overjoyed with the results. The highlight is probably the fact that the cast was nominated for the Best Performance award at the Singapore International Film festival. It is a dream for an actor to get international recognition and I was lucky enough to achieve that with my first movie.” He notes that Rakitha is a symbol of humanity, brotherhood, love and gratification. He links all the ethnic communities in the island. As a person he may seem gloomy and dull due to being battle-hardened and growing up as an orphan. “I love every aspect about the movie. It sends a positive message: we are all equal under the sun and moon. It was great acting with Saumya Liyanage. He was full of advice and helped me to perform my role with zest. Apart from four newcomers we had 22 experienced actors working on the sets. I feel very fortunate to launch my movie career with one of the best teams in Sri Lanka,” he says. Though his business takes most of his time, Udara is keen to take on more projects when time permits. He admits that he is not very choosy when it comes to selecting roles. “I am happy as long as the character is challenging and adds depth to the product,” he opines adding that he is also engaged in a new teledrama. He aims to become a versatile actor while balancing it with his profession. “My family has been very supportive. They have stood beside me through thick and thin. I believe Ira Handa Yata addresses people’s hearts because it certainly spoke to mine,” he concluded with a smile. Dhammika Siriwardena’s maiden movie direction and production Suwanda Danuna Jeewithe will be screening in several foreign countries. The movie which stars Roshan Ranawana and Pooja Umashanker in lead roles will be screening in theatres in Perth - Australia, Rome - Italy and Frankfurt - Germany. Would you let a total stranger change your life forever? Two people can meet ‘Anywhere’... In a cab on a rainy New York afternoon, at the neighborhood bar, in a queue waiting to use the ATM Machine, on a plane, deep sea diving, in the middle of an earth quake, sitting on that famous bench at the Taj Mahal or standing under the Pyramids in Egypt. You can meet someone in the most mundane of circumstances or in the most exotic ones. Akash and Kiara meet. But they meet in a situation as unusual as no other. But what if the two people who meet as strangers want to stay that way? They want to end right where they started - as strangers. This is the story of two strangers on an odyssey of discovery - down a path that is ridden with the exquisite pain and joy of falling in love, only they don’t realize it. A series of hilarious misadventures trace their bi-coastal road journey as they go about fulfilling their last wishes. But then life interrupts, as is its habit; and painful choices must be made. The duo part with the understanding that their days together were a brief interlude of insanity that had to succumb to real life. Buzz is, Priyanka Chopra is finally happy with her attempts to get the perfect nose. The change is there for all to see! Chopra walked the ramp for Salman’s Being Human show recently. At the event, her visage was under the scanner as her nose definitely looked different yet again! Speculation was that the actress had gone under the knife. There was buzz that PC’s recent trip to London was to fix her nose that has been causing her grief for the past few years. A source reveals, “Priyanka has always been unhappy with the way her nose looks. In the past too, she has tried to get a defined sharp features. They part as they met-as strangers. But can a cloaked love so strange between two strangers conquer the idiom of normalcy we all believe in. Is it worth another chance? Is it worth leaving behind all that is familiar? Is it a love in time; is it truly the beginning they never expected? Follow Akash and Kiara, along this hilarious, contemporary yet poignant journey of stumbling into all that is worth living for. Anjaana Anjaani, subtitled in English is screening at Majestic cinema, Colombo. 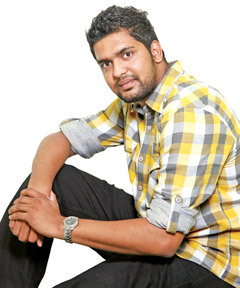 Nirmal Abeysinghe of Pitasakwala Abhirahasa fame will begin work on his second movie Aguwana soon. Lasantha Kamalasiri, Mukthi Udara, Anjula Gamage, arosha Kanchana, Dinesha Rukmali and other new actors will star in Aguwana. The script, dialogs, screenplay, editing and camera are by also Rajapaksa. 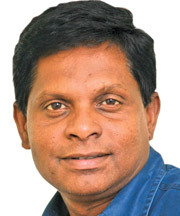 Lasantha Kamalasiri is the assistant director. Sanka Indunil is the second assistant director. Iduranga Weerasuriya is the trimensional director while arosh Kanchana is the mproduction manager. The music is handled by Psycho music band. Lyrics are by Kalpa Eranda. 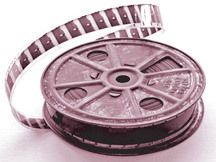 Ridee Thiraya (Silver Screen), a radio program which promotes cinema had been launched by the National Film corporation in collaboration with SLBC. The program will go on air on Sunday from 10am to 10.30am. Mahindagamanaya Sanath Abeysekara’s movie which is based on Arahat Mahinda thera’s visit to Sri Lanka will begin shooting at Thanthirimale soon. The palaces and backdrop is almost complete. Ven Uduwe Dammaloka Thera took part in a dubbing process. This is the first time that he had dubbed for a movie. Oshadi Hewamadduma will cut her tresses to portray Anula Devi’s role with effect. Joe Abeywickrama, Jeevan Kumaratunga, Dilhani Ashokamala, Roshan Ranawana and others are part of the cast in Mahindagamanaya which is produced by Daminda Upali Fernando. Sanath’s previous production Australian Dollars is complete and will begin screening soon.